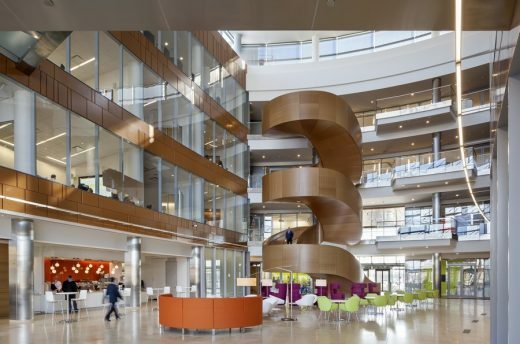 GSK has been transforming its workspace throughout the world, and evolving and enhancing the collaborative model with each project. 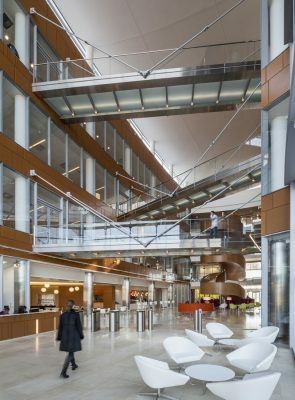 The Navy Yard is the first office built and designed from the ground up to meet GSK’s needs for a flexible, interactive, healthy, and productive workspace. Prior to the move, Francis Cauffman created three pilot projects where GSK employees tested furniture and technology solutions. The employee feedback on furniture and ergonomic features was incorporated into the final design. 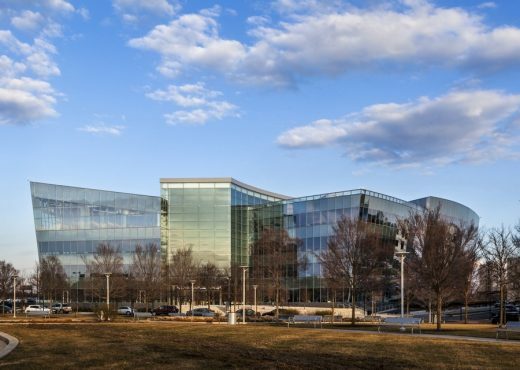 The first floor has a cafeteria and coffee bar, a fitness center, a production studio, a help lounge, a health clinic, and a company store where employees can purchase GSK consumer healthcare products. A conference center on the fourth floor includes a large multiple-purpose room that can be used for Town Hall Meetings, or it can be subdivided into training or meeting rooms. A rooftop garden and patio can be used by employees during the day or for corporate events. Francis Cauffman worked with Haworth, a furniture manufacturer, to develop a height-adjustable benching system. Unlike the typical benching system, which seats six to eight people, these are based on a two-person module. The team conducted a thorough analysis to ensure that the desks met specific ergonomic requirements, including the ability to adjust the desktop for sitting or standing positions. Each desk has an ergonomically tapered front edge, adjustable monitor arms to ensure correct viewing angles, and fully adjustable ergonomic task seating. In addition, the U.S. Green Building Council (USGBC) selected the pilot for a new LEED credit in ergonomics that is under consideration. • The waste bins and the multi-functional printing devices are centrally located so people have to circulate. 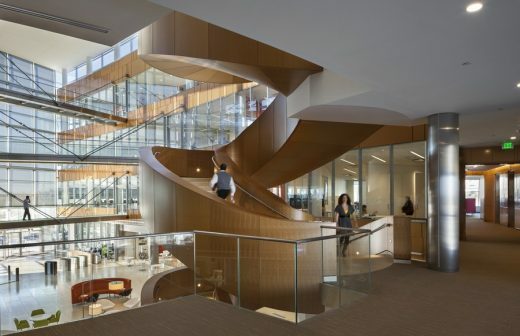 • The design encourages employees to use the stairs between floors. • The open office layout gives every employee direct access to natural daylight and views from his or her desk and nearly every meeting room. • Energy efficient fixtures and LED task lighting will contribute to a projected 25% reduction in lighting usage over ASHRAE 90.1-2007. • The layout maximizes natural daylight and views. An astronomical time clock and cloud sensor activates the automatic shades on windows based on the time of day and month to control glare. • A daylight harvesting system employed at all perimeter zones contributes to energy savings by dimming lights during periods when there is sufficient daylight. Lighting levels can be dimmed to 10% of their normal output in full daylight. • Energy Star-rated equipment reduces energy consumption. • The team is targeting a LEED-CI Platinum rating for the project. (FSC) certified wood, and low VOC materials. Desking and Conference Room Furniture: Haworth, Inc.
• GSK’s desire for increased visibility and collaboration in an open workplace resulted in a move to an activity-based work environment with unassigned seating, with a wide range of work settings that accommodate the needs of employees for both individual and collaborative work. 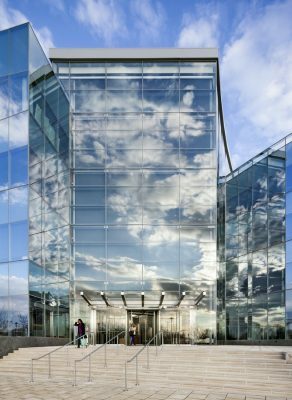 • At the request of GlaxoSmithKline (GSK), Francis Cauffman prototyped the design through pilot programs during the design phase to obtain employee feedback on the transformation of their office environment.